Canadian Feed The Children (CFTC) is delighted to announce a $2.4 million project to help farmers in Northern Ghana respond to the climate-related challenges they are increasingly facing in their daily lives. 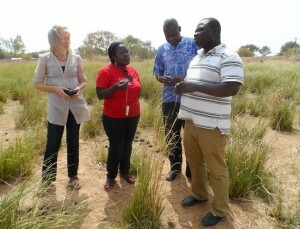 Members of the CHANGE project team inspect vetiver grass – the source material used by Bolga’s women basket weavers which also minimizes soil erosion. The Climate Change Adaptation in Northern Ghana Enhanced (CHANGE) Project extends CFTC’s existing work in Northern Ghana in the areas of food security and livelihoods. The project is funded by the Department of Foreign Affairs, Trade & Development (formerly CIDA), CFTC, and its Canadian coalition partner, Farm Radio International (FRI). The project will directly support approximately 109,000 women and men small-scale farmers in 17 communities in the most vulnerable Northern, Upper East and Upper West Regions of Ghana. It will offer training on sustainable farming techniques and improved access to information on agricultural data and seasonal weather forecasts. Radio programming will disseminate climate adaptation information to an additional 670,000 beneficiaries, including government agricultural extension workers and community farm-based organizations. The goal is to improve farmers’ adaptive capacity and resilience to the impacts of climate change on agriculture, food security and livelihoods. “Food insecurity and non-sustainable land use are major challenges for the small-scale farmers of Northern Ghana. Desertification, soil depletion and climate change are realities, meaning that hunger, malnutrition, especially of children under five, and widespread food insecurity – rates of which are all historically high – are on the rise,” said Debra Kerby, Executive Director of Canadian Feed The Children.“There is an integral link between climate change and poverty. We must do more to strengthen the resilience and build the adaptive capacity of these farmers, and open up more opportunities for women in particular to engage in agricultural production and other livelihood options to achieve sustainable, long-term self-sufficiency in the region,” she added. 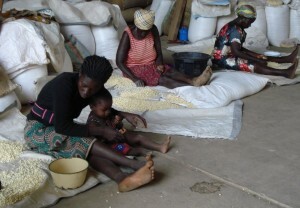 Women processing maize (corn) in Bolga, Upper East Region, Ghana. Indigenous knowledge and traditional farming practices empower women and allow communities to tackle climate change. The CHANGE Project will stimulate alternative, sustainable income generation for women with the added bonus of environmental benefits. Some of the project’s initiatives include growing grasses that protect soil from erosion and provide the materials for basket weaving by local women’s groups, and a fruit tree nursery component expected to supplement farming family nutrition while contributing to the greening of local spaces. 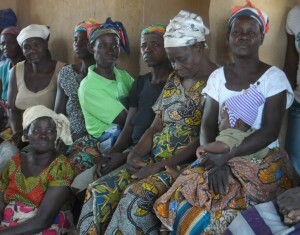 The 15-month project, which commenced in January 2013, is being implemented in collaboration with three local community partners in Northern Ghana: Regional Advisory Information and Network Systems (RAINS), Trade Aid Integrated (TAI), and Tumu Deanery Rural Integrated Development Program (TUDRIDEP). The community-based approach is expected to increase farm yields and income, reducing the disproportionate impact of climate change on women farmers by offering options for sustainable agricultural and non-agricultural livelihoods.